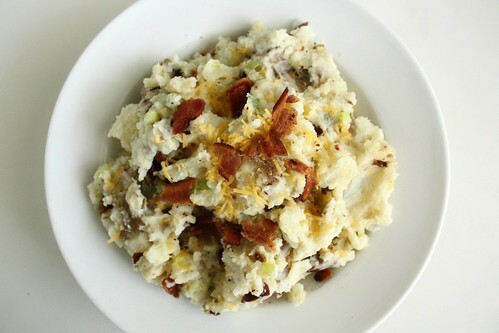 These Restaurant Style Smashed Potatoes are what I served along side the Long Boy "Burgers." I am a firm believer that potatoes make everything better and this version of smashed potatoes is basically a baked potato in smashed form. This specific recipe comes from The Pioneer Woman and if you'd like to see step by step photos you can do so here. As always all of these amounts are up to you and what you like. I didn't add any French Fried Onions since I didn't have any, but I bet they'd be a tasty addition. 1. Nuke potatoes or bake in the oven until fork-tender. 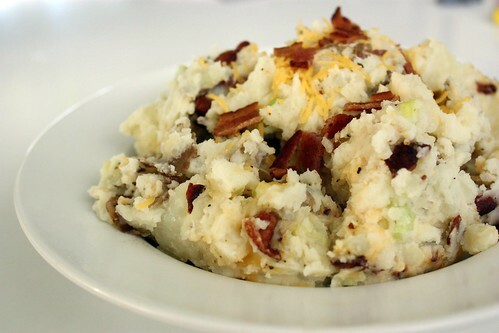 Add to a large bowl and smash with a potato masher. 2. Immediately add softened butter, green onions, bacon, and sour cream and stir with a rubber spatula. Add salt and pepper to taste. Add french fried onions and fold in. 3. Serve hot, sprinkling on extra french fried onions and green onions.